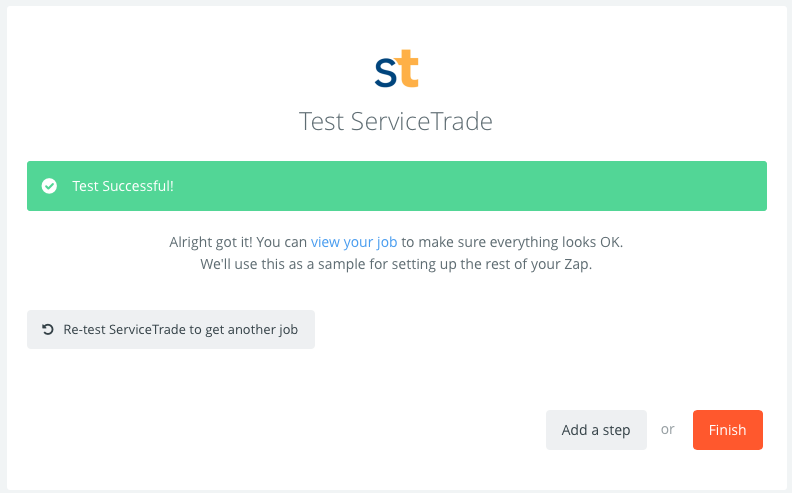 Zapier allows you to connect thousands of applications to ServiceTrade. This article will walk you through the basic steps of connecting an app to your ServiceTrade account. 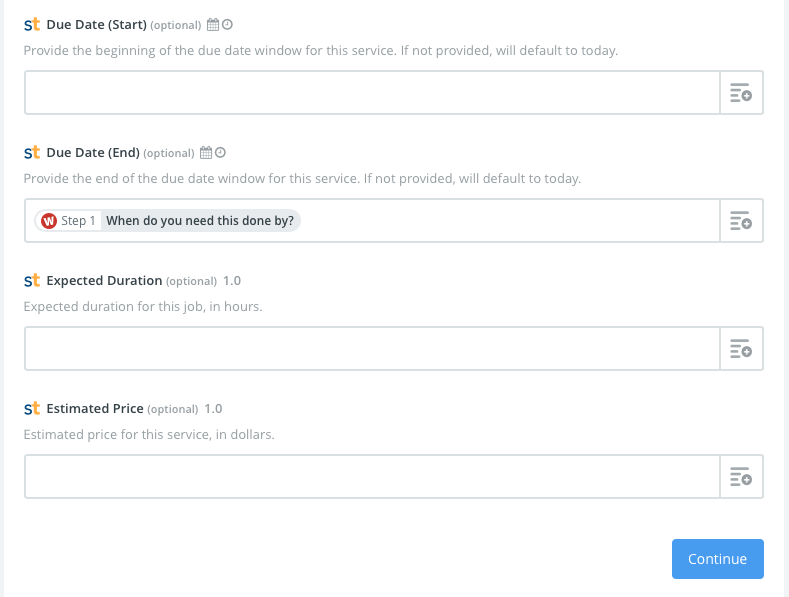 For this example, we'll connect a WuFoo service request form so that it creates a new Customer and unscheduled Job in ServiceTrade. Note that Zapier integration is only available to our Premium and Enterprise subscription users, so if you aren't one of those tiers, please contact Sales to get upgraded in order to use Zapier! Now that you've gotten all that setup out of the way, let's get started! Most of this is pretty straightforward form creation stuff using their editor, but for the "What kind of service will this be?" dropdown, here are the options that I set up. These should correspond to the types of jobs you want your customer to be able to choose from. 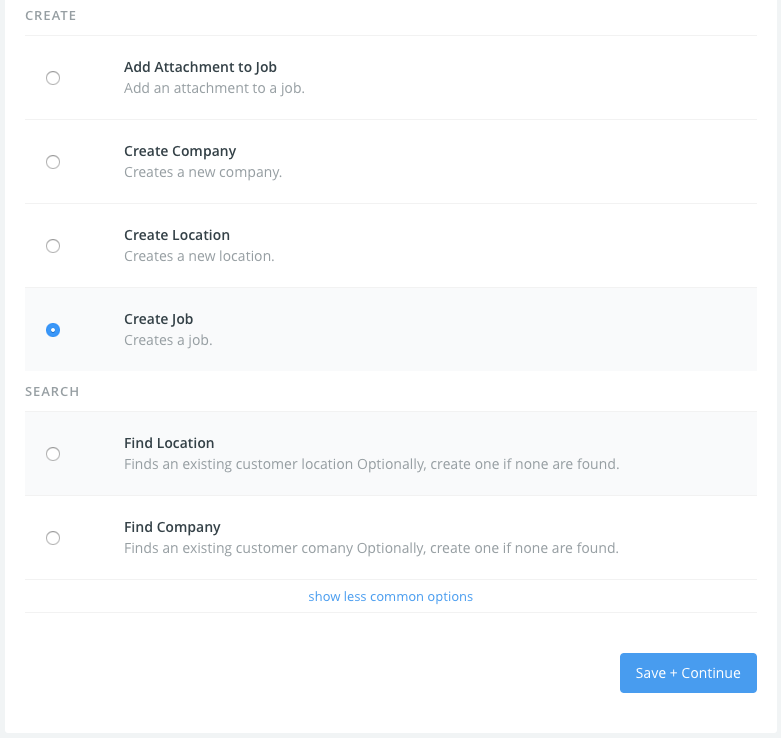 If you only want one type of job to be created in ServiceTrade, there's no need to have this dropdown on your form, since we can hardcode the job type later if we want. 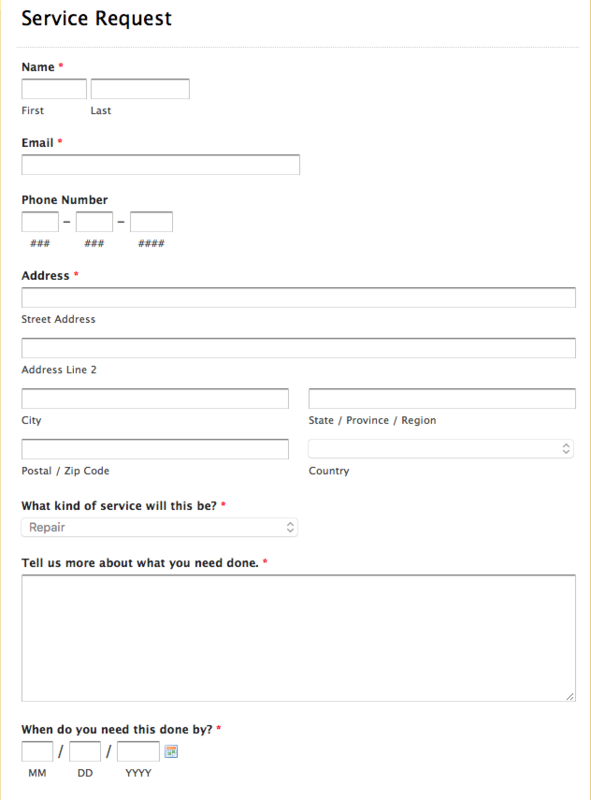 Once you have the form created, go ahead and fill it out one time to test it and make sure that it works. This is actually required by Zapier to connect up your WuFoo account. 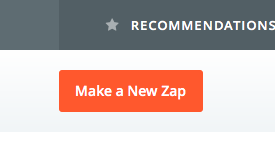 Create a new Zap by clicking "Make a New Zap" once you've logged into Zapier. Now select "New Entry" as the Trigger, which is probably your only option anyway. Click "Continue." Now it's time to select your WuFoo account. 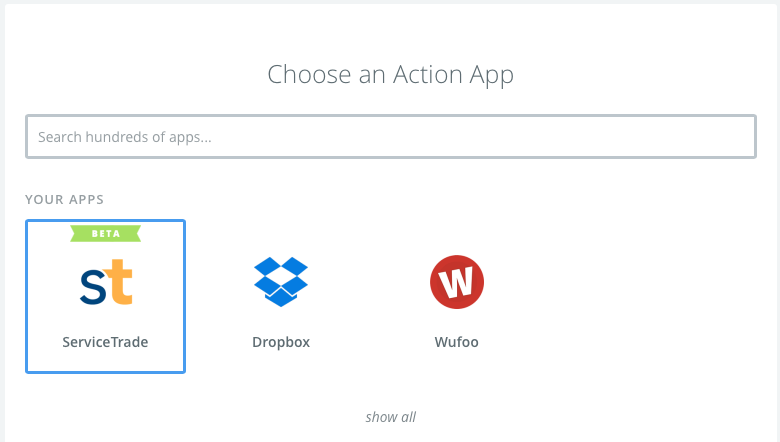 Note that the first time you do this, it will want your WuFoo login credentials to connect WuFoo to Zapier. For future Zaps, you won't have to enter this. After connecting your WuFoo account, click "Continue." 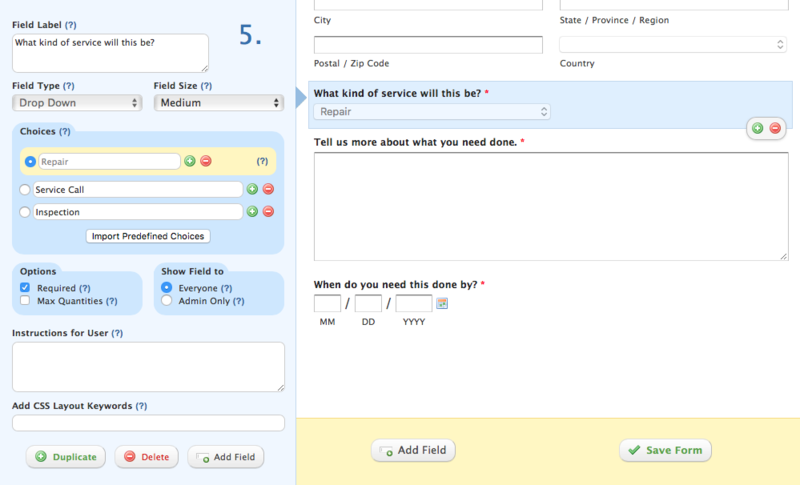 Now you can choose your service request form from the Dropdown. and you can click "Continue" to start setting up the ServiceTrade connection. Choose "ServiceTrade" as your Action App. In order to create a new unscheduled Job from our service request form, we must first make sure that the customer is either already in our ServiceTrade account, or we must create a new customer record for them. The first step in this process is to choose "Find Company" under "Search" for the Action. Click "Save + Continue". You will now need to connect your ServiceTrade account, similar to how you connected your WuFoo account in previous steps. Once this is done you should see something similar to this screen. Click "Save + Continue". 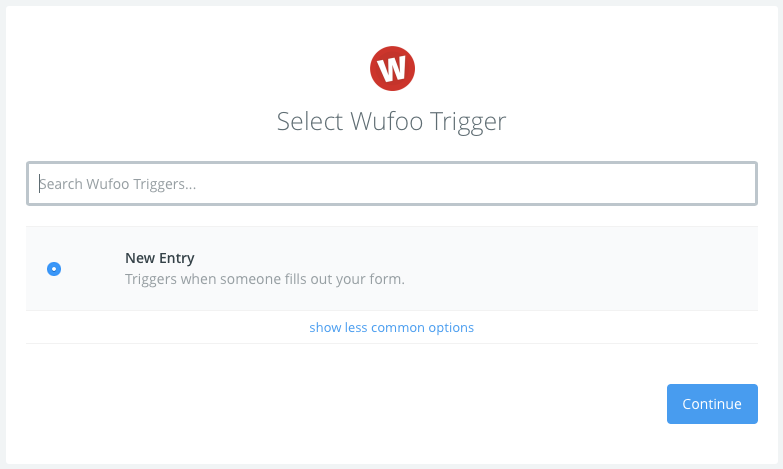 Now it's time to fill out the required fields by selecting form information gathered by the "Trigger" step from your WuFoo form. In this case, we're considering our customer to have the same information for Company and for Location (meaning we send our tech to the same place we send our bill). You could easily have set up a more complicated WuFoo form that collected billing information separately from shipping information. To select data, click the plus icon to the right of each field and choose from your WuFoo form options. 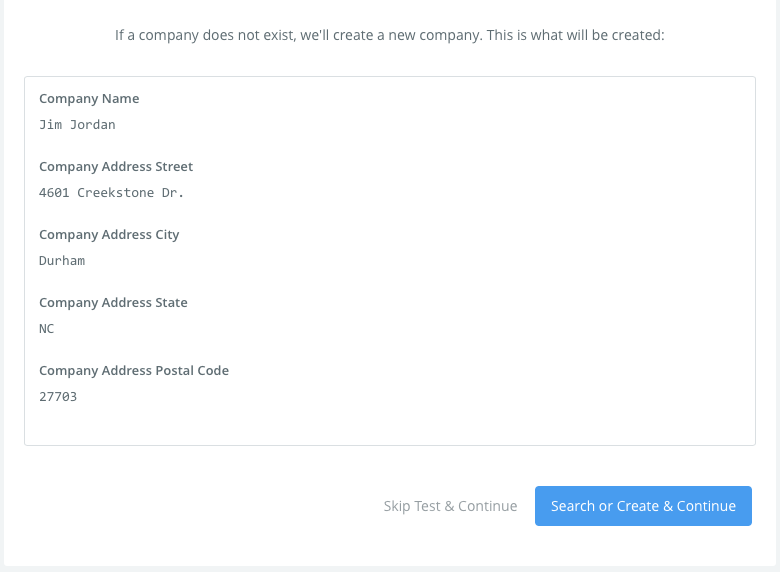 Note that you can put more than one form field into each ServiceTrade field, as I have done with "Company Name" being generated from "Name: First Name: Last" below. 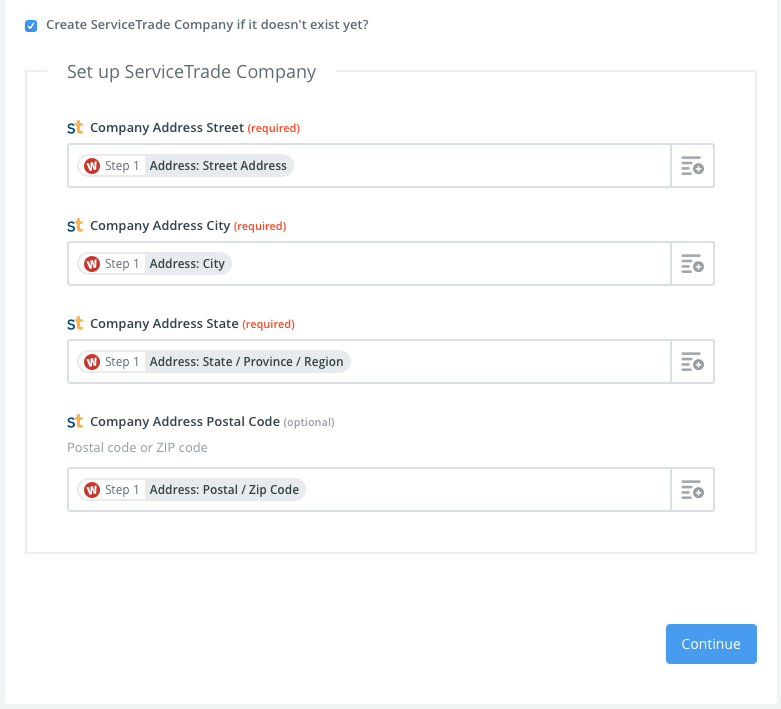 Before continuing, we need to check the box for "Create ServiceTrade Company if it doesn't exist yet?" because if we can't find a company for this customer, we can have Zapier create it for us! You'll need to specify all the required fields just like in the previous step. Now click "Continue." 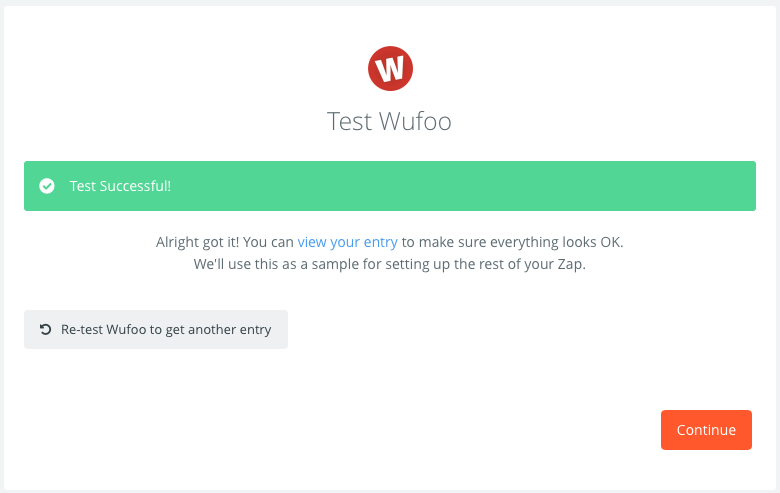 Zapier will prompt you to test the creation of a Company based on the test form data you previously filled out and tested at the end of configuring the WuFoo trigger. 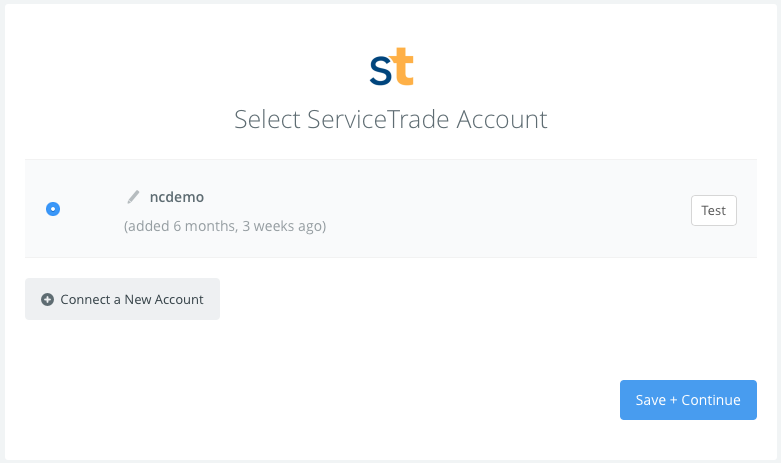 Now you can go to your ServiceTrade account and search for that Company and it should be there. Awesome, right?! OK, now we need to get the Location search or create action set up. Click the "Add a Step" button to continue our multi-step Zap. 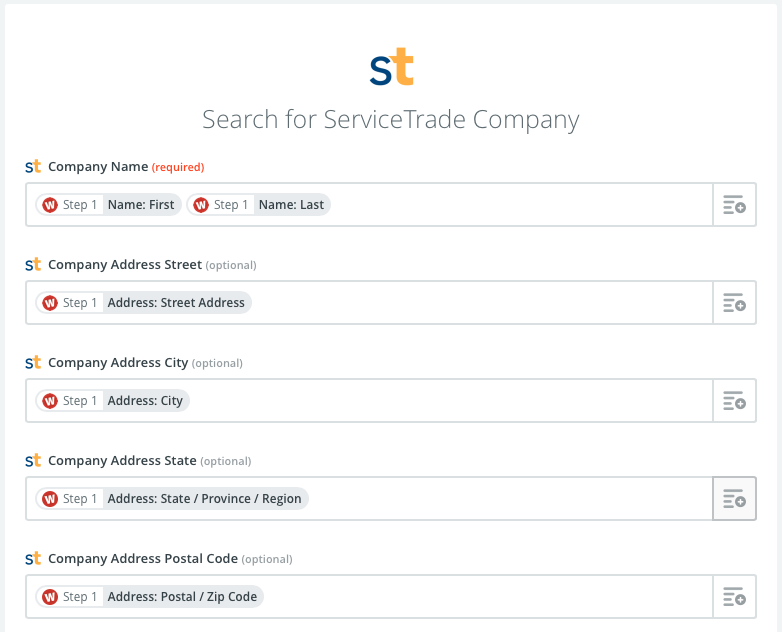 Choose ServiceTrade as the "Action App" and then choose "Find Location" under Search. Fill out the rest of the fields much like you did with the Company step. 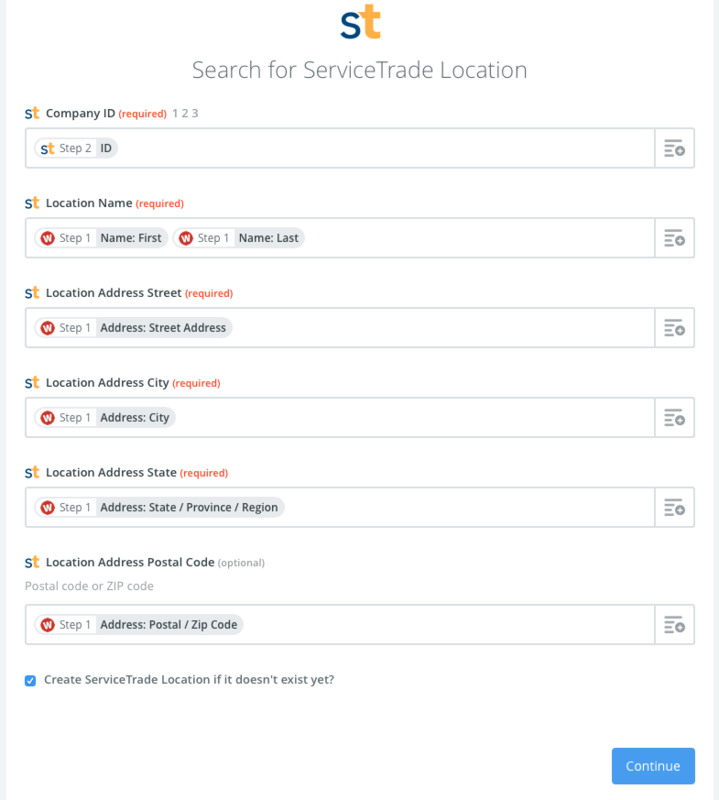 Make sure to check the box for "Create ServiceTrade Location if it doesn't exist yet?" as well. Click "Continue." 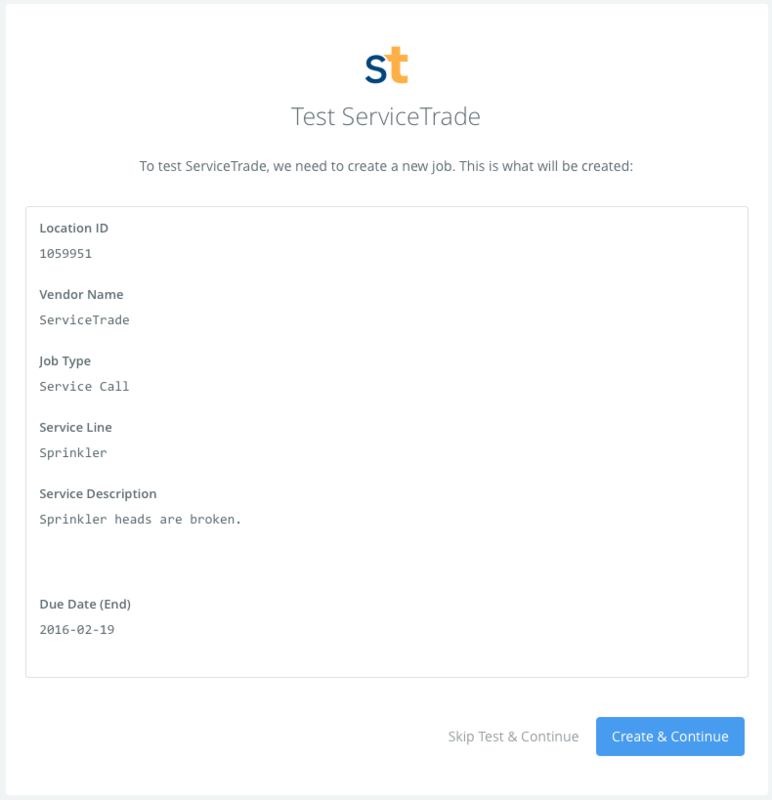 Now you should click "Search or Create & Continue" to test this step, and once you see the Success screen, the customer will now have a Location in addition to a Company in your ServiceTrade account! The last step is to configure our Zap to create a job record. Click "Add a step" and choose "ServiceTrade" as the "Action App" again. Choose "Create Job" this time. Now we need to select the "Vendor Name." In most cases, you will just choose your own company from the drop-down list, but if you wanted to always sub-contract the jobs created by this WuFoo form to one of your vendors, you can choose them here. Next up is the "Job Type." You can choose to hardcode this value by choosing something from the list, which means that all jobs created from new form submissions will start as that job type. 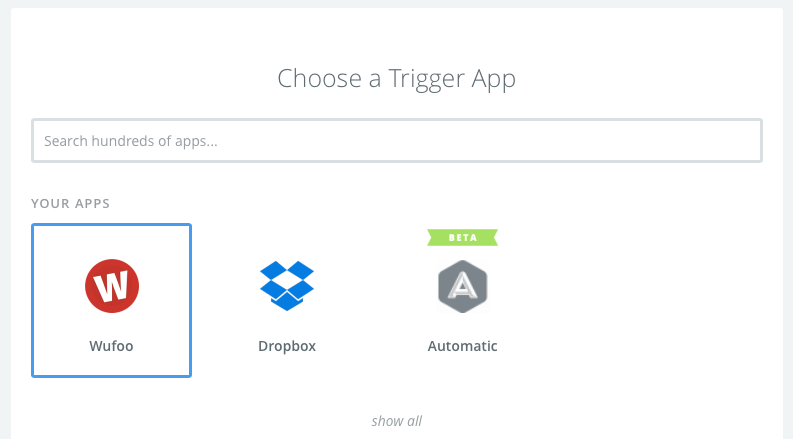 However, you can also choose "Custom Value" and choose the output of our Trigger in Step 1 for the "What kind of work will this be?" question, as I have done here. I'm going to leave the "Due Date (Start)" blank, since that tells the system to default to "Today", but I will put in the answer to "When do you need this done by?" as the "Due Date (End)". The resulting job in ServiceTrade will show as due from Today to that date. Since both "Expected Duration" and "Estimated Price" are optional, I won't populate those as our WuFoo form didn't ask the customer about that information. Click "Finish." Congratulations! You can now name your Zap and turn it on, and whenever a customer fills out your WuFoo form, a Company, Location, and unscheduled Job will be created in ServiceTrade.